Last Saturday I taught a pants fitting class for a quilt store. The owner sponsored an ASG class I taught called Ready-to-Wear knock-offs and invited me back to teach the pants fitting class. It was a fun class for me to teach because I think a few of the students might actually try to sew themselves a pair of pants. After the class a couple of the students asked me how much I would charge to do the fitting alterations for them. Since my goal is to teach, I declined. This first one is simply an overlay with cut-outs. It would be very simple to do if you had the right template for the cut-outs. I think I could probably do something similar using this template. I could eliminate the stem for a couple of the flowers and enlarge and decrease the size of the flower as well. It's a good place to start anyway. 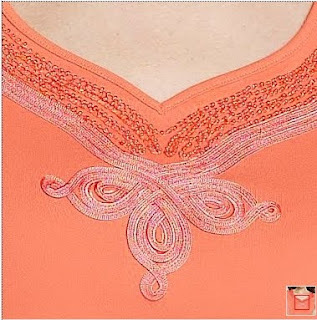 Another simple element that could be added to a t-shirt neckline would be to add some embellishments like this bead and soutache trim. I could use the pattern as is except to change the shape of the neckline. This pretty flower applique would be very simple to do. It appears to be oval shapes that are gathered in the center and applied in bunches. Simple but would take a plain t-shirt into the spectacular range. I even have a cross-over t-shirt already drafted. This simple t-shirt is quite lovely with the lace at the neckline. 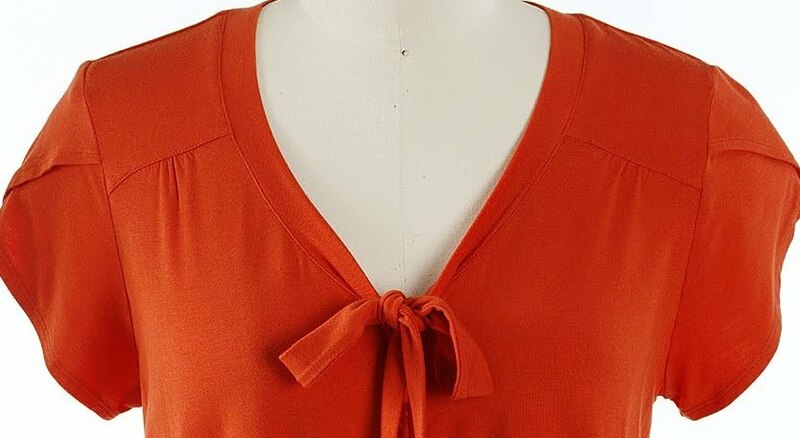 I think this one will be the first one I do because I already have the fabric and lace picked out in a spring orange color and a skirt that I could wear it with. It will require a redraft of the neckline and shoulder area, but it wouldn't be hard to do. 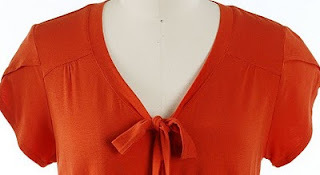 This top is a button down blouse, but I think the yoke with gathers and the tie/binding would look good on a t-shirt as well. The redraft would be quite easy to do and I think the gathers would flatter my bustline. It's a bit like the HP Metropolitan Tie Me Down Top in shape which I really liked, but hated to do the shirring. This would give me the shape I want without having to sew the elastic. Win-win! 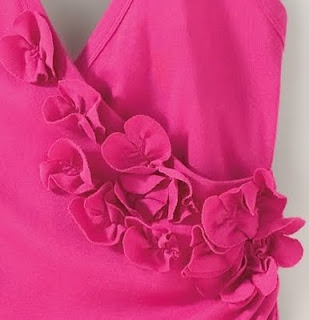 This pleated top would take more redesign that the others, but it wouldn't be hard to do. Just seam lines added and pattern pieces spread for the pleats. 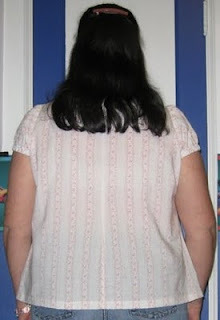 The neckline shape would need to be altered as well. Don't you think a very short pleat puffed sleeve would look darling with the bodice pleats? I can't say how many of these I'll get done before the class, which is scheduled for June 12th. The class will be held at Patchwork Penguin in Tujunga at 10:00 am. It's a cute store and if you are anywhere near the area, you should stop in to visit. You knew I was going to do it, didn't you? Frankly, so did I. I mean, how am I supposed to visit the Los Angeles garment district and not come home with great fabric. OK, so I've been know to do it, but it's been almost 4 months since I've bought fabric. I was weak. But you've got to see what I found! This fabric was discovered amongst the cotton voile. It's such a pretty spring fabric that would make an adorable top. Doesn't the fabric look like a garden party? I bought 4 yards just because I couldn't decide between a blouse and a summer dress. 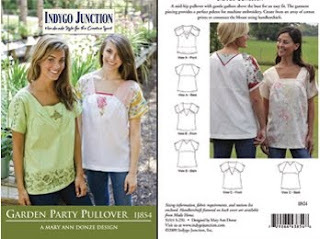 I'm thinking that this Indygo Junction pattern called Garden Party Pullover will look lovely in my new fabric. I even already own the pattern. At first I was sad that the fabric contained some poly along with the cotton. That was until they told me that it was $2 yard. It was purchased at Michael Levine's and I got to use my ASG discount for even more savings. This lovely fabric, also from Michael Levine's, is a cotton/lycra twill and unfortunately they only had 1-1/2 yards left. I imagine it sold out quickly after being marked down from $10 to $5. I got all of it thinking I could get at least a skirt for the summer out of it. 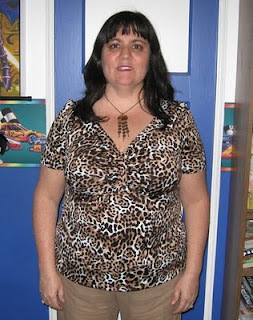 I have a couple of skirt patterns that I can alter or if I work it just right, maybe it could become a summer shift dress if I lose enough weight to look good in such a thing. The third fabric I bought from Michael Levine's was a poly/lycra jersey with a very large pattern that is repeated all over. The color is a bit off and is more olive and brown than the strange green that is showing up on my monitor. I got 3 yards since it was only $2/yd and I thought I might need extra to work with the large motif. Any ideas? Maybe the Jalie Sweetheart top pattern? Debbie Cook used a motif fabric for the top and it turned out beautifully. This sweet trim was found at Buttons and Trims for $2/yd and is decorated with sequins and beads. I thought it would look good at the hem of a blouse so I got 2 yards. I had a great time shopping with my friend and co-worker, Cathy. She went to school for fashion design at LA Trade Tech and was a pattern grader for a few years but hadn't been downtown in almost 30 years. We really enjoyed the FIDM museum exhibit: Hollywood 2010, The Art of Motion Picture Costume Design which featured over 100 costumes from more than two dozen of last year's movies such as Julie & Julia, Star Trek, An Education, and The Young Victoria. We also got to see the fashions from The Duchess, the 2009 Academy Award winner for Best Costume Design. My favorite was the costumes done for Where the Wild Things Are. Even though the movie was made with computer animation, they still had to do full size models to be digitized in 3-D. Amazing! I wanted to tell everyone who heard me say that Kash-Cool had disappeared that it is not gone, just different. They've changed the name to L.A. Alex's and have moved the cash register from the left of the door to the right. The owners are even the same. I'm sure you be relieved to hear the good news. On the next block north of L.A. Alex's is a new notions store that sells dress forms, rulers, industrial machines, thread, and lots of other goodies that I didn't have time to explore. I didn't even get the name of the store, sorry. I can't wait to go back and give this little gen of a store the time it deserves. And on a different note, I called my Dr. this morning. I left a message for him and his clerk got back to me while we were on the road downtown. She said that the dr. said he did talk to my husband after the surgery. Yea, I know that. She said that the dr. said that he removed all the polyps and that the pathology was clean. Yea, how does he know that without a report? She said he said that I was to talk to him about it when I have my 2-week follow up visit. That's going to be a neat trick since he wasn't available for a 2-week follow up visit when it was convenient for me so I have an appointment with his nurse practitioner. I do hope somebody knows what they are doing. After reading Beangirl's post about Goodwill, I thought twice about posting my Goodwill thrift store finds. But you've just got to see what I found today. First, it helps to shop the Goodwill store in a better neighborhood. We visited the store in Lake Forrest (for those who don't know it's upscale Orange County, as in The OC) instead of Pomona. There was a definite difference in the quality of the merchandise. This lovely China Silk top from Coldwater Creek was bought by my friend for $4.99. I picked it out for me, but it was too small so my friend tried it on and it will go perfect with the new denim skirt she just bought at Ross. I have to take it in at the neckline on the shoulder seam so that she isn't completely exposed to the world, that's why I have it instead of her. I didn't go home empty handed, however. I found this very cute asymmetrical knit top in a beautiful teal blue colorway for $4.49. It's a bit tight right now, but should be perfect for me for summer. I have a stretch denim in that color that needs to be a skirt or some capris. I can't decide. I also found this cute ITY knit top with an interesting yoke and bust gathers. The sleeves are adorable as well. The color looks good on me too and it was only $5.49. However, my favorite find today was my new summer purse. Isn't it beautiful? I love the summer colors, the fact that it was cloth instead of plastic, and that it had real wood handles. It looked brand new, with no wear or dirt at all. It's the perfect size to fit all my summer stuff. I'm usually not crazy about a purse that has a divider in the center, but since the cosmetics and cell phone pocket help to distinguish each side area from the other, I decided that I could make it work. I love the fact that the inside was pink. The center compartment had this bright and happy sun shaped zipper pull that was adorable. And since my girlfriend had just gotten home from Hawaii the day before yesterday, I was convinced that this purse had to be mine. The $4.99 price tag didn't hurt either. It was a good day today. I want to thank everyone for your good wishes and prayers for me. I didn't get a hold of my Dr. today and I may not have time to call tomorrow since I'll be visiting the museum at The Fashion Institute of Design and Merchandising in downtown Los Angeles tomorrow and shopping the garment district fabric stores. I'm of the belief that if it was bad news I can wait for it and if it was bad news they'd get a hold of me to let me know. So I plan to enjoy the rest of my spring break touching and feeling fabric and trying hard to keep to my fabric fast. Wish me luck! I made it through my procedure yesterday. It was such an ordeal, especially when the surgery center had me come in six hours before getting me into the operating room. My mother in law had her cataract surgery scheduled on the same day so my husband had to be with her. She is 77 yo, has no husband and Bob is her only child. Of course he had to be with her. That worked out OK because while I was waiting my six hours, six hours!, he showed up before they took me in. It was nice to have him there with me. When the Dr. was finished with my procedure he went out and told my husband that I had several polyps in my uterus. I'm guessing he removed them. I'm guessing that we are waiting to hear from the pathologist. The Dr. never came in to talk to me after the procedure. I have a follow-up office visit scheduled with the nurse practitioner on April 5th. I hope that if they find cancer, that at least they call me before my appointment. I mean, it would be nice to know. 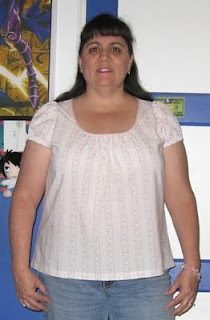 The good news is that I feel fine today and am planning on cutting out and sewing a couple of new tops. I haven't decided exactly what patterns I'll use. Thank you everyone who kept me in their thoughts and prayers. I'll update again as soon as I hear something more. It's the first day of Spring break and I actually got something made. It's NL 6891 and I really like it. Unfortunately it's a tad too big and has that maternity thing going on. However, that's the current style so I look fashionable. That's my story and I'm sticking to it. This was my muslin and it has fitting issues, but I still think it turned out cute. I'm toying with the idea of making pink knit shorts and calling it summer pajamas. The back needs darts to get a better fit but since it's supposed to be a looser style I think it looks good without them. What it really needs is a drapey fabric. If I make it again I'll use a chiffon or some type of silky fabric. I don't know why I'm so attracted to this style of pattern. It rarely looks good on someone with a bust line. You can read my review here on Patternreview.com. Monday starts my spring break so no work for a week. It's great to have the time off, but I don't get paid for time off. I've been lazy about sewing lately. I think it's because I'm still losing weight and I don't want to sew a lot of things because I know they won't fit for very long. However, my plan today is to cut out a few new tops for spring using patterns I haven't sewn before. Sewing my TNTs, I was always guaranteed a great fitting garment, but now those patterns are all too big. I'm back to sewing blindly again and I'm not comfortable doing that so wish me luck! I also wanted to share that on Tuesday I go in for my D&C to check for cancer cells. I've never had this procedure done before and after looking it up on the internet and seeing a video of one actually being performed (I know that was a stupid thing to watch) I'm so thrilled I'll be completely out for the procedure. I'm getting nervous about it. My husband will not be with me on Tuesday because he has to be with his mom who is having her cataract surgery the same day. She is divorced and Bob is her only child so he really needs to be with her. That means I have to find someone else to take me to the hospital and bring me home. I think I'll ask my Dad to be there for me. I'm sure he'll be happy to help. After I'm feeling better, I hope there is still some of my week off left to get back to the sewing machine. I'm feeling the need for pretty spring clothes. I wore a dress to work yesterday and got nice compliments on it and I didn't even make it. Dresses will shrink with me better than pants will so that's what I want to sew along with some skirts and tops. I'm also going to have to start lesson planning since I think that the city parks and rec classes finally have some students signed up. I have to make a sample PJ pants and a sample collarless robe made before the end of the month. Will shopping for these garments count? I'm on a fabric fast for the entire year and haven't cheated even once. Maybe I already have something in my stash I can use. Repeat after me, "It's fun to shop the stash." Also, next Saturday I'm teaching a pants fitting class at a quilt store. Lots of prep to do before that class as well. I should be feeling better by then, I hope! I'm Feeling a bit Wild! I got some sewing done this weekend, which included Monday, as I had the day off. I worked on NL 6940 and I thought the fit would be good enough so I went ahead and used the good fabric. I was wrong. While technically it does fit, it fits way too closely for my comfort. There are way too many rolls showing, although that may be hard to see with my busy fabric. It's the first size 16 pattern I've used in about a hundred years. 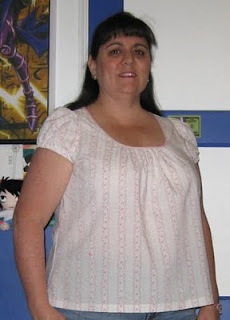 I usually opt for a size 18 and then I upsize it generously in the bust and hips. For this size 16, I only added a tad to the hips and did a full bust adjustment. I think by this summer it should fit perfectly, so I'm not calling it a wadder, but I certainly won't wear it out of the house any time soon. There are some fit issues, like the way the fabric collapses under the bust. I'll need to remove some length there. In the photo I have the hem pinned up about 5 inches. I've shortened the sleeves 2 inches and won't be doing the elastic to rouch up the hem. All in all it's a nice pattern and it gives me a place to start with alterations for my smaller body. I think if I just add about 1/2" to the sideseams, I can make this again and actually wear it out of the house. 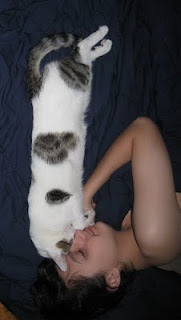 Here's a picture of my son and our newest feline acquisition. He's about 6 months old now and has grown to be a very large boy cat. We did think he was a female at first. His new name is Reggie and Steven loves him. Here they are sleeping on his bed. I don't know why Blogger decided to rotate the photo. That's not the way the pic is on my hard drive. More later when I can get back to the sewing machine.